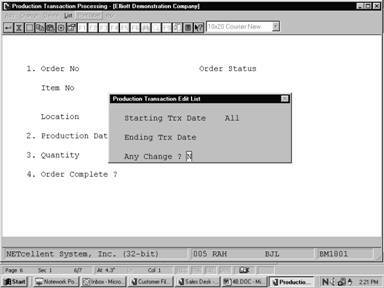 The Production Transaction Processing application allows for reporting progress made toward completing production work orders. Transaction information will reside in a transaction file until it is posted through the Post Production Transactions application. This application has been designed to provide the user with solutions to many common mis-reporting problems that may occur. If over-production of an order occurs, components will be automatically deallocated and have quantity on-hand reduced. Also, finished goods will have quantity on-hand increased by the reported amount. 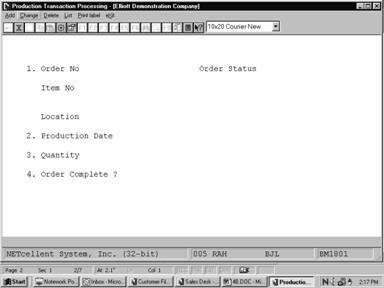 This will take place regardless of whether the Work In Process (WIP) feature was selected when work orders were printed, or if the order was flagged as "complete" by a previously posted transaction. Under-production, even to the extreme of reporting zero (0) items produced, can be handled by flagging the order as complete and posting the transaction. The technique commonly referred to as "back-flushing" will then be implemented by the system in this situation. Any transactions entered against the order after it is flagged as complete will be treated as over-production (see above). Negative quantity transactions are also allowed by the system. You may enter negative quantities up to but not greater than the total quantity reported for the order to date. Regardless of the order's status, all quantity allocated and on-hand adjustments will be made automatically. When processing Production Transactions for serialized end items, records are written to the Production Transactions and Serial/Lot Files simultaneously when answering N to the Any Changes? question at the bottom of the screen. If the ESC key is pressed at the Any Changes? question, these files are still updated. If the transaction is not desired, it must be deleted. 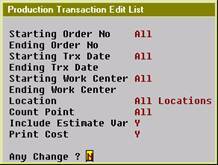 * Select the desired mode from the Production Transaction Processing menu bar. Enter the number of the production order on which progress will be reported. The status, item number, description, location, and quantity remaining to be produced will be automatically displayed. 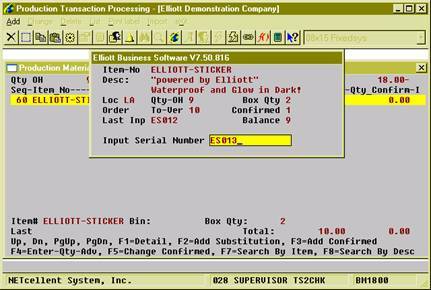 In add mode, press the F1 key to display the next production order number and its status information. In change mode, press the F1 key to display the next production transaction. The status of the order number will be displayed as new, work order printed, partially reported, or complete. The number and description of the item being produced will be displayed. The location code and description of where the item is being produced will be displayed. Enter the date the items being reported were produced. In add mode, press RETURN for the current date. In change mode, press the F1 or RETURN key to display the next production transaction on file. 8 numeric digits including 3 decimal places and an optional minus sign. Enter the quantity of items that are being reported as produced. This amount will automatically be deducted from the Qty Remaining field. If the quantity entered is greater than the quantity remaining, the user will be informed that this will over-produce the order and will be asked if this is Ok. A quantity of zero is allowed for the purpose of completing an order. A negative quantity is also allowed to reverse previously reported production. Default is the quantity remaining. This is the difference between the quantity ordered and the quantity reported so far. When this quantity reaches zero, the order will be considered complete unless the user enters N in field #4. A negative quantity will be displayed if more items have been reported than were ordered. If the order is considered complete, whether or not there is a quantity remaining, enter Y. If the order still has items to be produced, enter N. If there is any quantity remaining, the default is N. If quantity remaining is less than one, the default is Y. Note: If this flag is changed to Y, it may not be changed back to N. Also, the order will no longer appear on the Production Schedule Report. The following entry will be requested when lot items are being produced. 15 alphanumeric characters if not using batch numbers in BOMP Setup. Enter the lot number of the item being produced. For more information on lot transactions, see the Application Overview section of the Inventory Transaction Processing application in the I/M manual. Enter the batch number of the item being produced. Enter the expiration month of the lot. Enter the last two digits of the expiration year for the lot. The following entry will be requested when serial items are being produced. If Y is entered, the user will be prompted to enter a serial number and a starting batch number. The application will automatically assign serial numbers to all items being reported. The first item will have the starting batch number and each following serial/batch number will be incremented by one. If N is entered or if batch numbers are not specified in BOMP Setup, the user will be prompted to manually enter a serial number for each item. Enter the serial number, which will be assigned, to the serialized item being produced. Entry is required. Enter the batch number, which will be an extension of the item's serial number. Entry is required. Enter the starting date for the range of production transactions to be printed. Defaults to All. 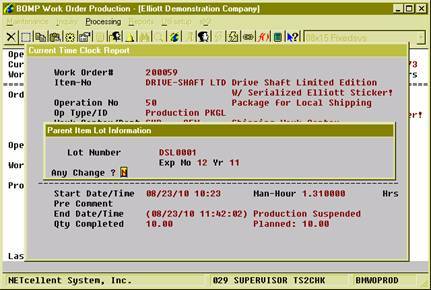 Enter the ending date for the range of production transactions to be printed. Defaults to the starting date. This is the traditional way to create, edit and delete production transactions. The operator needs to enter all the data of a transaction and is allowed to edit most of the fields, in most cases. If you are not planning to adopt the time clock system WO+ provides, you can always report production through this interface. Also, the Transaction Edit List can print out all the details of each transaction before they are posted. The list will print all warnings and errors a transaction would encounter during posting so a manager can correct them. Only some exceptions can be handled through this screen, like reversing a transaction or overriding a post exception. Edit a transaction. If the transaction was created through scanning, thus contained a production number, only certain fields can be modified. Delete a transaction. If the transaction was created through scanning, thus contained a production number, it cannot be deleted. Import transactions from a CSV file (not implemented yet). Create a reverse transaction from a posted transaction. If a transaction cannot be posted due to an exception, you can flag the transaction so the post program will override the exception. Enter the Work Order Number to report. F1 Key - In add mode, choose the next order number. In change and delete mode, choose the next transaction. Enter the operation number to report. F7 Key - Search for operation number. F4 Key - In add mode and if the operation has not been started, you can change the value of this operator, like Work Center, Default Labor Grade, etc. In change mode, press the F1 Key or leave this field blank and all transactions for this operation will be displayed. Enter a specific date and transactions reported on that date will be displayed. Enter the ID of the operator who reported this transaction. If an operator ID is given, the system will use the labor rate of this operator to calculate direct labor cost. The operator ID cannot be changed if this transaction was reported through scanning. F7 Key - Search Operator ID. Enter the quantity of pieces which are successfully processed for this operation. F2 Key - In change mode, change the issued material. F3 Key - In change mode, change the PO information for an outside process operation. F5 Key - In change mode, allow this transaction to override any exception that occurs during the post. F7 Key - In add mode, select a posted transaction from history to create a reverse transaction. The reverse transaction has the opposite values of that in the selected transaction for quantity, hour and cost. Defaults to the quantity completed from a previous operation, but not processed in the current operation. Enter the quantity scrapped during production. The operator cannot report scrap for Setup Operations. If this is an outside process operation in Add mode, the system will prompt for PO Information after the Rejected Quantity has been entered. The direct labor hours used for this production. If this transaction was created manually, the system will calculate direct labor cost based on the time and operator’s labor rate, if provided. If the operator ID is not provided, the system will use the standard direct labor rate defined in the Operation file. This field cannot be changed if the transaction was created through scanning. Defaults to the planned direct labor hours, which is calculated based on quantity and standard direct labor rate (Qty/Hrs, fixed hours, etc.). The shared labor hours used for this production. If this transaction was created manually, the system will calculate shared labor cost based on the time and standard shared labor rate defined in the Operation file. Defaults to the planned shared labor hours, which is calculated based on quantity and standard direct labor rate (Qty/Hrs, fixed hours, etc.). The machine hours used for this production. Defaults to the planned machine hours, which is calculated based on quantity and standard machine rate (Qty/Hrs, fixed hours, etc.). Enter “Y” if this order is complete and is going to be closed. This field is only available if the transaction is for the last operation. The status of the order will be examined and if any error occurs, like when transactions are missing, the system will not allow the order to be closed. Default value is based on the order status. If all conditions are satisfied, the default is “Y”. If the parent item is a lot item and the transaction is for the last operation, the system will prompt for the lot information for the completed parent items. If the Serial/Lot Batch Number is used in BOMP (a flag in BOMP Setup), the system will prompt for 11 alpha-numeric characters for the Lot Number and 5 alpha-numeric characters for the Batch Number. Otherwise, the system will simply prompt for 15 alpha-numeric characters for the Lot Number. Also, the system will prompt for an expiration month and year. Indicate if the transaction should post if any exception occurs. This field cannot be directly accessed by entering a field number. The operator needs to press the F5 Key while in the quantity field. Also, the operator is required to have enough security to change this flag. The Transaction Edit List can print out detailed information for each selected transaction. This includes any warnings or errors. You can print an edit list before posting and examine the statistics for any exception that might happen. The range of order numbers to appear on the report. Defaults to All. A date in standard date format. The date range of the transactions to appear on the report. The work center range to appear on the report. Defaults to All. 2 alpha-numeric digits, with wildcard support. Select the operation type for the transactions. M - Material Issue Point only. Y - Y Count Point only. B - Both Material Issue Point and Y Count Point only. Enter “Y” to print the cost variance for those operations which use estimated statistics, like labor hours per quantity, instead of standard statistics. Enter “Y” to print the cost on the edit list. This flag is subject to several security flags and the BOMP Setup. If the operator is not authorized to view cost, this option will be not applicable. If labels are needed for the finished products, this program outputs an item number for the completed pieces in the selected range of work orders to a CSV file. 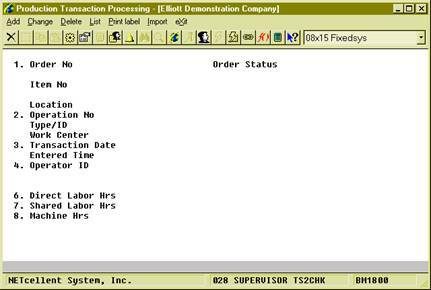 For example, if 10 pieces of product in a work order are finished, this program will create 10 records in the CSV file. A barcode printing program, like Bartender, can be used to print the barcode labels from the CSV file. You can enable this feature and fine tune the parameters through the Barcode Printing Global Setup. Materials will be used to manufacture parent items and they can be issued in certain operations based on the definition in each work order. Those operations which issue material are called Material Issue Points. In WO+, more than one operation can be a material issue point. For flexibility, even if an operation is not defined as a material issue point in the work order, you can still issue material in the operation. This might be a situation where the operator needs to return some materials when the order is complete. Also, material usage may be different between planning and production, therefore the operator can change the issued quantity or substitute material when reporting. There are two modes to report material, Material Verification Mode and Material Confirmation Mode. You can switch from one mode to another though the BOMP Global Setup field 51, Enforce Material Verification in Production. The reporting screen will have two different modes. How to bring up Issued Material Reporting? 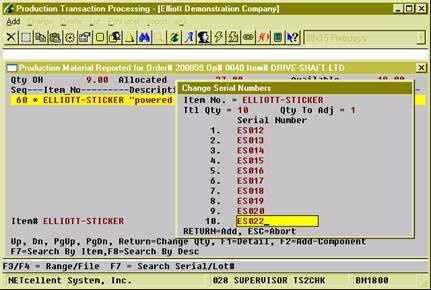 Elliott will automatically pop up the Material Reporting screen when an operator is reporting for a material issue point. The screen will display all materials which are planned to be issued for this work order. At this point you can verify if the item number and quantity are correct. Extra steps are required to bring up this screen if the operator wants to report issued material for an operation which is not a material issue point. This is available in Production Transaction Processing and Work Order Production. In Add mode, populate every field for a transaction. Select field 5, Qty Complete/Qty Received. Press the F2 Key to bring up the Issued Material Reporting screen. Answer “Y” to the question and cursor will move back to the Qty Completed field. Press the F5 Key to bring up the Detail Reporting screen. In the Qty Completed/Qty Received field, press the F2 Key to bring up the Issued Material Reporting screen. Even if the operation is a Material Issue Point, the operator can use the same steps to bring up the Issued Material Reporting screen. Depending on the BOMP Global Setup, the Issued Material Reporting screen can be one of two modes. (Figure 4) Issued Material Reporting. Confirmation Mode. Changing Material. Setting BOMP Global Setup field 51, Enforce Material Verification in Production, to “N” will set this screen to Confirmation mode. In this mode, the system will display all materials based on the planned quantities in the work order bill of material and prompt, “Any change?” Respond with “N” to issue material based on this list. Otherwise the system will bring up the next stage, Change mode. Press the Up or Down Arrow Keys to move the highlight bar. Press Page Up or Page Down to change to scroll a page at a time. Press the Enter Key to change Actual Issued Quantity for the highlighted component. A positive quantity means issue material with this amount. A zero quantity means the material is not used. A negative quantity means the components are being returned to stock. This is useful when the order is complete and there are some components left. Press the F1 Key to view and change the material detail. The detail includes material location and actual issued quantity. Press the F2 Key to add substitute material. Press the F7 Key or F8 Key to search the Item file. Enter a valid Item Number, UPC or GTIN. If the item is in the list, the system will move the cursor to that item and ask the operator to change the actual issued quantity. 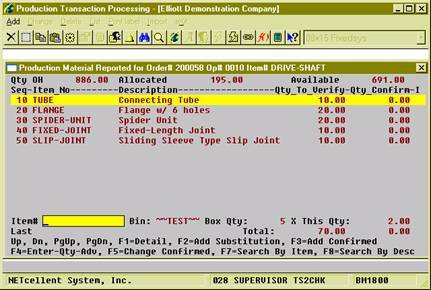 If the item is not in the list, the system will allow the operator to add the item as substitute material to the list. Press the Escape Key to exit the screen. (Figure 5) Issued Material Reporting. Verification Mode. Setting BOMP Global Setup field 51, Enforce Material Verification in Production, to “Y” will bring up this screen in Verification mode. In this mode, the operator needs to enter through every component required for this work order before exiting the screen. Therefore, the Confirmed Quantity of each component defaults to zero. 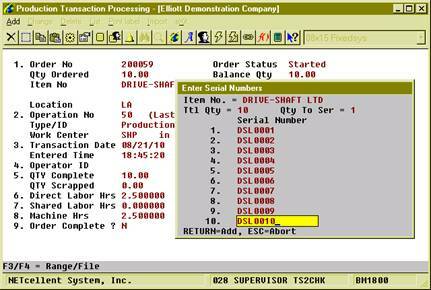 Each time an operator enters an item number, the system will accumulate the confirmed quantity of that component. If 10 pieces of one component are used during the production, the operator can enter the item number 10 times. The system not only accepts the Item Number, but the UPC or GTIN can be entered if they are defined. Each time the item number or UPC is entered, the system will accumulate the confirmed quantity by one. However, you can define this quantity to be the product of the Package/Box Quantity and Quantity in Advance for each entry. Package/Box Quantity is the quantity of a component packaged in one box. For example, the component TUBE in Figure 32 is packaged 5 per box (see Box Qty: 5) and scanning the barcode on the box confirms 5 pieces. The Package/Box Quantity is defined in the Item Master file and a BOMP Global Setup defines which field represents the package/box quantity. If the GTIN is scanned, the system will use the package quantity defined in the GTIN. Quantity in Advance is the number of component units to report. Figure 32 is configured to report 2 boxes of TUBE (see X This Qty: 2), so when the item is scanned the confirmed quantity of this component will accumulate 10 pieces. The system will record which input method is used to verify these components, Scan or Manual Entry. If the barcode tag on each component is scanned for a component, the system sets entry method for that component to Scanned and an “S” will be displayed on the right side of the line (see the FLANGE line in Figure 33). If the confirmed quantity is modified, the line is considered a Manual entry and an “M” will be displayed on the right side of the line (see the TUBE line in Figure 33). When a UPC or GTIN is used, the system always considers it as scanned. Overriding the quantity is always considered a manual entry. Whether the item number is manually entered or scanned is defined in the BOMP Global Setup. Exceptions can occur when verifying materials. Verifying too few or when a substitute material is to be used, the system will prompt for a supervisor password. Enter the correct password to override this exception. The BOMP Global Setup defines which actions are exceptions. Press the Up or Down Arrow Key to move the highlight bar. Press Page Up or Page Down to scroll a page at a time. Scan an UPC or GTIN Barcode. The system will accumulate the confirmed quantity of the corresponding component. The system always considers this action as a scan. Scan or type in the Item Number. The system will accumulate the confirmed quantity of the corresponding component. The system will consider this action as a scan or manual entry based on the BOMP Global Setup. If the BOMP Global Setup field “Enter Qty Before or After” is set to “A” for After, the Qty in Advance field can be changed after the item number has been entered. If the BOMP Global Setup field “Enter Qty Before or After” is set to “B” for Before, the quantity can be entered in the Item Number field. If a quantity is entered, the system will use the quantity as Qty in Advance. This quantity can only be a limited length integer. Press the F1 Key to view component detail. Press the F2 Key to add substitute material. When substitute material is added, the confirmed quantity will be set to zero and a quantity needs to be confirmed for this material. Press the F3 Key to directly accumulate for the highlighted component. This is always considered a manual entry. It may be an exception if defined as so in the BOMP Global Setup. Press the F4 Key to change Quantity in Advance. Press the F5 Key to directly change the confirmed quantity. This is always considered a manual entry. This is the only way to enter a negative quantity for the confirmed quantity. A positive confirmed quantity means you are issuing material. A quantity of zero means the material is not used. A negative quantity means the components are being returned to stock. This is useful when the order is complete and some components are left. Press the Escape Key to exit verification. If any component is under-verified or over-verified, the system will display a warning. If an operation is an outside process, the system will prompt for PO related information about the production. This will happen in the Work Order Production interface when production starts and when production is reported. The standard PO format is used if the PO package is on. If the PO package is off, the format is 10 alpha-numeric characters. The purchase order number of the outside process. This can be blank. If the PO package is on, this should be an existing PO but not a blanket PO. The purchase order line number for the PO of this outside process. This field is available if a PO number is entered. If the PO package is on, the item number for this line item should not exist in the item file. The vendor number of this outside process. This field is available to change if the PO number is not entered or the PO package is off. Otherwise, it should be the same as the vendor number in the purchase order. Receiver of the outside process. Invoice Number or Document Number of the outside process. If the PO package is on, a valid invoice/document number should be entered. If the invoice/document does not exist, the system will create a new one and prompt for a comment for the record. If the PO package is on, there are some benefits to linking a BOMP transaction to a PO line item. You can reference the data in BOMP back to Purchase Order. If the BOMP Global Setup field 36, Copy PO FOB Cost to WO+ Outside Process, is “Y”, the system will use the FOB cost in the PO to calculate the outside process cost instead of that defined in order routing. If the BOMP Global Setup field 37, Update PO Receiving thru WO+ Outside Proc Rpt, is “Y”, the system will automatically create a PO Receiving Transaction for the PO when the BOMP transaction is posted. However, the system will not allow a greater quantity to be received for the item than listed on the PO. Follow the instructions below to change this information after the transaction is created. In Add mode, populate every field for the transaction. At Field Number, enter 5 for the “Qty Complete/Qty Received” field. Press the F3 Key to bring up the Outside Process Additional Information screen. Answer “Y” and the cursor will move back to the “Qty Completed” field. In the “Qty Completed/Qty Received” field, press the F3 Key to bring up the Outside Process Additional Information screen. All fields can be left blank for this transaction. A serial number will need to reported for serialized parent items or components when the serial number system is in use. After every field of the transaction has been entered for the last operation, the system will pop up a screen to let the operator enter the serial numbers for the newly created serialized parent items. They will need to be entered one by one. If 10 pieces are reported, 10 serial numbers should be entered as well. The transaction will be aborted if enough serial numbers are not reported. 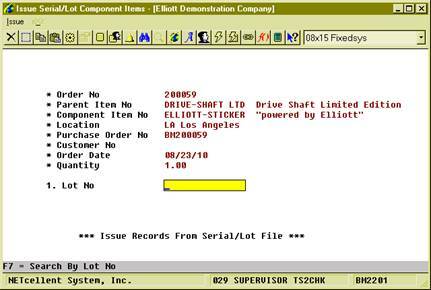 The Issued Material Reporting screen is used to report a serial number for an issued serialized component. The screen appears different for Confirmation mode and Verification mode. In Confirmation mode, the system will display an asterisk (*) for components in which serial numbers have not been reported (see Figure 36). Press Enter on this item and the Serial Number Reporting screen will pop up after entering the actual quantity. In Verification mode, the system will pop up a screen to enter serial numbers one by one after a valid item number has been entered. The quantity of issued materials is always the same as the number of serial numbers reported. Reporting production for a parent lot item on the last operation will prompt for lot information. 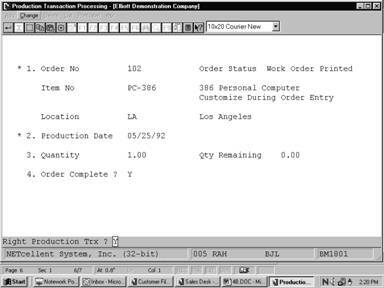 In the Work Order Production interface, the system will pop up a Lot Information screen after entering an amount in the Qty Completed field. If Batch Number is not used, this is 15 alpha-numeric characters. Otherwise, it is 11 alpha-numeric characters. Lot Number for the finished parent item. Batch number of the finished lot items. The system will combine the batch number (4 digits) and lot number (11 digits) into a 15 character lot number. Only available if BOMP Setup field 10, Use Serial/Lot Batch Numbers, is set to “Y”. 2 numeric digits. Must be a valid month. Month when the lot item expires. Year when the lot item expires. The lot number of issued lot items needs to be reported. It does not need to be reported immediately when reporting material. Another process is used to report these lot numbers: Issue Serial/Lot Component Items. Each time a work order is selected, the system will bring up one component issued for the work order and the lot number for the component can be reported.